The Hail Varsity staff is back for a new mailbag to answer your Husker questions. Brandon Vogel, Erin Sorensen, Greg Smith, Jacob Padilla, Derek Peterson and Hail Varsity’s 2019 Husker baseball beat writer Kyle Kardell are all here to tackle topics ranging from winter conditioning in football to spring training for baseball to women’s basketball and everything in between. JP: I wrote about that on Monday prior to Nebraska’s loss to Wisconsin, and in that game, Thorir Thorbjarnarson threw his hat into the ring by earning a rotation spot, according to Tim Miles after the game. But the simple answer is everyone. There isn’t a player on the roster that can come close to replacing what Copeland brought to the team. 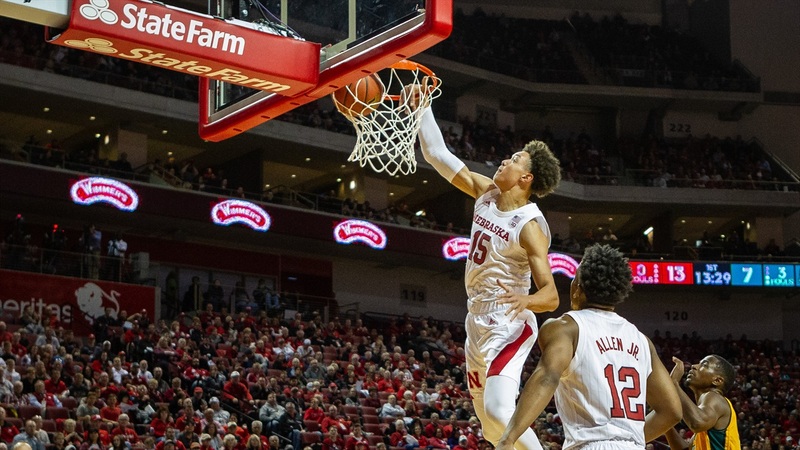 Instead, Nebraska needs a little more from James Palmer Jr., Glynn Watson Jr. and Thomas Allen Jr., a lot more from Isaiah Roby and some production (any at all) from the rest of those guys who now will get rotation minutes. DP: We’re seeing first-hand the toll it is taking on the starters having to carry the scoring burden each and every night. A lot will be written about this being Thomas Allen Jr.’s chance to showcase himself a little bit more (and I think that’s partially true) but this comes down to the bench. Guys off the bench played 44 minutes against Wisconsin. Those guys scored a combined three points. That just can’t happen. Nebraska needs its bench to resemble an actual bench. JP: I still need to see more. Tim Miles seemed to just be throwing everything he could at the wall to see what would stick in that Wisconsin game, and none of it really did. Nebraska will get some time to study that game film and see what worked better than the rest and they’ll have a few days of practice to work on building comfort with the new roles and rotations. If Nebraska loses at Illinois on Saturday, we’re probably looking at two or three wins at best the rest of the way. If they can pull it together and look solid in a win in Champaign, I’ll give them a shot to win maybe five or six more. DP: There are 10 games left. Five are on the road. I’m going to pick Nebraska to win one of those games. The home games are Maryland, Minnesota, Northwestern, Purdue and Iowa. I’m going to pick Nebraska to win two of those. So that 3-7 to close out the year. I feel for the kids on the team, a lot. But Miles tried just about everything he could try in that Wisconsin game and none of it worked. Nebraska will be competitive — they showed fight Tuesday night — but picking them outright is just hard to do at this point. JP: See my previous answer. If Nebraska can’t rally enough to beat Illinois, I see things continuing to go downhill and at that point, I don’t see a scenario in which he returns. Losing Copeland is something that should be considered in his case, but injuries happen every year to teams and this downward spiral started before he got hurt. DP: The expectations placed on Miles preseason remain the same — win a tournament game. As harsh as it might sound, I don’t think Copeland’s injury changes that expectation. ES: That’s what I typically figure. Last year, we quickly heard about the hospitalizations and just how rough those first few weeks were. This year? It feels like everyone has their head down and is getting to work. I’m sure it’s not any easier, but the team has gotten acclimated to the expectations. I also think it helps that they didn’t have quite as big of a break (even without a bowl game) between the end of last season and the start of conditioning like they did 2017 into 2018. That year was weird, because some players hadn’t worked out at all from the moment Mike Riley was fired until the new staff got conditioning rolling in January. This year, a lot of guys took it upon themselves to keep working out during those weeks off (and we saw plenty of that on personal Twitter accounts). With all that said, follow the Husker Power account if you’re not already. It provides some interesting insight from time-to-time. GS: No news is good news is a good way to approach this round of winter conditioning. Last year was about cutting fat and adding lean muscle mass. This winter, of course, is about that but also adding speed and explosion which is part of the “second phase” of what needs to happen under Duval. The players being in better shape to start with and knowing what the training will be like helps. JP: I would agree with that. This freshman class looks to be special and Nebraska’s got some really talented sophomores as well. As those underclassmen continue to develop and learn how to win, Amy Williams is going to have a salty group on her hands. As for Miles, I’d agree that a coach like Izzo would have done better with this roster, but he also would have put together a better roster in the first place. A lot of people seemed to gloss over the very real issues with the roster construction this year because of the starting five, but that bench is a serious problem, especially when the starters aren’t playing as well as they can. That goes back to Miles’ staff’s recruiting, development and roster management. Yeah, that starting five is nice, but there weren’t enough good players on the team to survive a full season and we’re seeing that play out in front of our eyes right now. DP: Jacob did well with the men’s basketball side of the question, I’ll stick more to the women’s basketball side. All things considered, I think this season has become about setting up next season. The freshmen group — Sam Haiby and Leigha Brown (two leading scorers), Ashtyn Veerbeek (maybe the most talented player on the roster) and Kayla Mershon (already pushed her way into the starting five with her defense) — should inspire plenty of excitement going forward. Especially when paired with sophomore sharpshooter Taylor Kissinger. Nicea Eliely and Hannah Whitish are both exactly what you want in upperclassmen in that they’re capable producers but willing to cede spotlight. And they’re following the trend you like to see from a young team: competitive in almost every game and taking tough teams to the wire. Nebraska hasn’t been able to close out tight games this season but when the squad is so young, those close losses are more learning tools than heartbreaks. The future is bright. KK: Pretty early to tell right now, but we will learn a lot during their brutal nonconference stretch. I think “motivated” is a good word to use with this team. They felt like they had some bad luck last year with injuries and if things could go wrong, they usually did. Everyone that I have heard from talks about their excitement for a healthy pitching group. This team could have some good options when they are at full strength. Nebraska will need to find ways to make up for batting production with the loss of guys like Jesse Wilkening and Scott Schreiber. Look for more spread out contribution across the lineup and for Angelo Altavilla to have a bounce-back season. JP: This is tough. Perhaps the Washington Wizards? They’ve got some pretty talented players on that team but the chemistry has been off all season leading to a dysfunctional year, and now the Wizards are without one of their best players in John Wall for the rest of the season. Washington is 21-29 and in 10th place in a weak Eastern Conference, 3.5 games out of the playoffs. Their coach, Scott Brooks, has received plenty of criticism as well. It’s tough to find a good comparison for playing style because I’m not quite sure what that style is for Nebraska; they’ve been all over the place on both ends of the court. BV: For highlight dunks I think it’s better to have an impeded line to the hoop and then just go over someone. But since that’s off the table, I would like to break the backboard. I always enjoyed the power dunkers more. GS: This is very easy for me. My perfect dunk would be a 360 two-handed dunk over Dwight Howard. (I’ve thought about this before). JP: Considering you can probably measure my max vertical with a ruler, any dunk at all would be a perfect dunk for me. DP: Simple between the legs slam off a bounce with an ode to Vince Carter. The “It’s Over, Ladies and Gentlemen,” dunk remains my all-time favorite. ES: Well, what about instead of a play, Chipotle does half-off burrito bowls when Nebraska hits six wins (therefore becoming eligible for a bowl!). Ha. Wendy’s could obviously do something with Frostys for Frost and make a good promo out of it. But really, the Big Mac Sack promo is one of the best. Can we just reopen McDonald’s? JP: No, we can’t. McDonald’s is trash. BV: Taco TakeOpps. Any time the Huskers defense creates six or more takeaway opportunities (forced fumbles, passes defended) in a game, ticket holders get 10 tacos for the price of five. And just so you know what we’re working with here, the national average for TakeOpps per game across college football last year was 5.23, while Nebraska averaged 6.75 (and that was thanks to a huge jump over the second half of the season). But we can work out the math with whichever company chooses to offer the promotion. Because I don’t want to start a taco war, I’m not specifying whose tacos they will be. First one to jump at this exciting opportunity gets it. I just know I want tacos. ES: No offense to Rex Burkhead, but I’m on Team Suh. I’d like to see the Rams win it (partially because I’m a Chiefs fan and I’m over the Patriots) but because you also get a Zac Taylor win if you take Suh. Plus, Suh’s been in the NFL longer and it feels like it’s time for him to be a Super Bowl champion. JP: I can’t really ignore the rest of their teams, though. It’s just hard for me to root for the Patriots. Rex Burkhead seems like as good of a guy as you’ll find and he was a lot of fun to watch, but growing up watching Nebraska football (I was born in 1992 and didn’t really start following closely until the mid-2000s), that 2009 team was the peak of my Nebraska football fandom. That’s the best Husker team I’ve seen and Suh was the reason for that. I’m still mad about that Heisman vote (Fourth?! Are you kidding?!). But long story short, I’m rooting for the Rams because A) they’re not the Patriots and B) I still have a soft spot for Suh even though his NFL career has gone a bit differently than we expected when he left Nebraska. GS: Rex is great but even as a Bears fan I’d be Team Vikings or Packers before I’d cheer for the Patriots. So, it’s Team Suh all the way. BV: I’m Team Suh because he’s one of the best football players I’ve ever seen, and, while I don’t think players like that necessarily need to validate their greatness with a title, the perception is that great players are greater with titles. So let’s just do that. KK: I also must factor in the teams. It is hard for me to root for the Rams when they probably don’t deserve to be there. My heart hurts for the Saints. I’ll go Team Rex. ES: There is some pressure, yes, and I think a majority of it – as we know – is on basketball. Does firing Miles and replacing him turn it around? Maybe. That’s the hope any time you replace a coach (and obviously we don’t know how that all will play out just yet). I think in some cases, like with football, patience is key. Most know that though, and I don’t think anyone’s hopping off the Frost bandwagon yet. I’d just give it time, but keep an eye on basketball.